Coin collecting today has a large and active number of collectors seeking Barber half dollars in all ranges of preservation and condition. Values importantly vary from $8.96 as of 4/22/2019 and can reach into the thousands of dollars depending on grade. 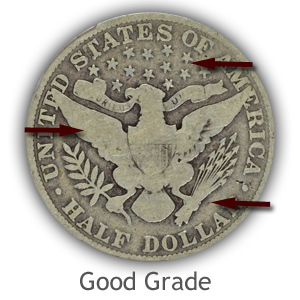 Grading Barber half dollars accurately narrows what to expect the potential worth of your coin. Begin with the grading video and continue by comparing your coins with the images. Overall appearance of a coin is a great indication of its condition and grade. Heavily worn Barber halves project a hazy tired look. Moderate wear and the coin begins to stand out as nice. Light wear and sharp details remaining and the first impression is crisp and appealing. An uncirculated example displaying luster has a "wow" and "valuable" appearance. A comparison of the following images visually demonstrates these levels of grade. Premium grade of a Barber half dollar is the Mint State - Uncirculated condition. These coins are avidly sought by collectors. Essential to this grade is the absence of wear to the surface. 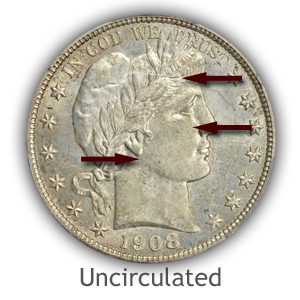 Close inspection to the highest parts of the design is needed to confirm the coin never circulated through commerce. 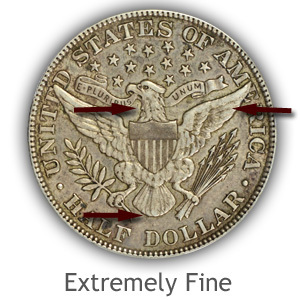 Use a single light source, tilt and rotate the coin to view the fine details of the surface. Toning may be present however the fine texture of the original luster is necessary to remain. High in profile and prone to first wear; inspect the hair above the eye and forehead for any smoothness and flattening. Liberty's cheek just below the eye must remain covered in texture. Note: this area is often toned a soft silver verses a bright silver although the fine grains of texture will show through. From the chin to the ear, the jaw line shows no evidence of wear causing a smoothness. Fine details must remain on the Eagle's head and central high point of neck. Trace amounts of wear shows as a distinct change in the color the silver and a dullness. Inspect the tips of the Eagle's wings and along the upper edges. Luster remains and a high rounded profile is not disturbed. Tail feathers are finely detailed and covered with luster. First signs of wear appear on the center feather as a loss of small details. Luster covers the elements of the shield, both the vertical and horizontal stripes. Inspect closely the wide vertical stripes to confirm the uncirculated grade. 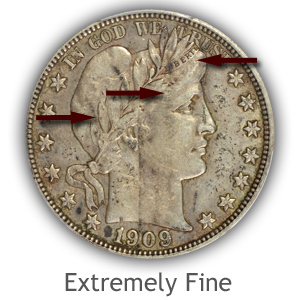 Small amounts of wear is visible on an Extremely Fine grade Barber half dollar. These coins however retain a sharp appearance. Adding to their appeal, original mint luster is often found in the protected areas around the obverse stars and lettering and many parts of the reverse. Attractive and remaining well detailed these coins are popular with collectors often building collections exclusively in this grade. A few strict guidelines are followed when judging and confirming the extremely fine grade. Importantly, wear must be light with certain key elements of the design remaining. All letters of "Liberty" are visible and bold on the headband. Inspect closely the headband and confirm both the top and bottom edges of the band are visible and well defined. A distinct line separates Liberty's hair from her forehead and is complete extending to the ear. Flatness is found only on high points of hair detail. Leaves of the Laurel wreath are well detailed, completely outlined and with only minor wear to the edges. Close attention is needed to the leaves above and close to the ear. The ribbon and knot at the back of the neck is well defined with ribbon showing dimension and depth. Liberty's cap is complete, separated from the leaves and showing only small areas of flatness. Eagle's head and neck are distinctly separated and bold with only minor loss of detail. Evidence of wear is confined to the tops of the feathers. All major detail to separation of wing feathers is bold, majority of fine lines remain. Slight flattening is noted along top edges of wing and very top edges of feathers. Tail feathers are separated with only edge wear visible. Inspect center feather for separation and along bottom edge of feathers. Horizontal lines of shield remain separated. Note: upper right area of lines is often weakly struck, slight merging of line results. Presented is a Barber half dollar in the Fine grade. There remains enough design detail and appeal to place most Barber halves in this condition solidly in the collector category. Moderate, even wear is displayed and without any distracting marks the design is still well displayed. The major requirement to the Fine grade is inspecting the headband searching for the letters of Liberty. Judge also the design elements on the rest of the coin to confirm only moderate wear is present and the Fine grade is accurate. Important that all seven letters of "Liberty" are visible. Upper and lower portions of headband are missing often leaving "ER" weak and slightly faded. Hair line above the eye has merged with the forehead, however the lower leaves of laurel wreath are mostly outlined. Upper leaves are strongly outlined from behind the ear to top of head. Roundness and dimension have flattened. Liberty cap is separated from leaves with only minor merging. Flat areas of cheek, chin and neck do not connect leaving a strong jaw line. Eagle's head detail and neck have merged, a clear separation of neck to shield remains. Major feather groups of wing remain and are bold, most fine feather detail now flat. Tail feathers are beginning to merge confined mostly to the lower edges. E Pluribus Unum is visible on the ribbon in the Eagle's beak. Vertical lines in shield are distinct, many horizontal lines are merged. Eagle's talons are recognizable and slightly separated from the arrow shafts and olive branch. 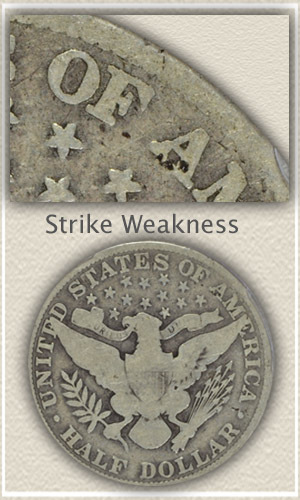 Heavy wear characterizes the Good grade of a Barber half dollar. Visually bold are the portrait, lettering and date. The majority of both the fine and major details have worn to a smooth, flat outline. Visual appeal in this grade has a big impact on value. As a coin wears to the extent of losing most detail it runs the risk of projecting a hazy washed out appearance. Solid for the grade examples need to retain a certain degree of boldness. A strong outline of the portrait remains. Liberty is clearly separated from the field and the ribbon and knot are strong. A clear visual suggestion of an eye, ear and a few of the leaves of the wreath are showing. Rim, although often slightly faded is clearly separated from a bold date; stars and lettering also raised and clear of the rim. Eagle is worn to mostly an outline, some detail remains, notably within the shield. Inspect closely the tips of the Eagle's wings; no merging with the lettering is visible and a separation remains. All the stars above the eagle, ribbon in Eagle's beak, arrows and olive branch in Eagle's talons are all clear from the field. Fading of the rim is often seem in areas with the a slight touching of the lettering. A clear rim, separate of letters, indicates a solid Good grade coin. Reaching an accurate grade is a combination close inspection of the surface. Recognizing and judging the presences of key markers that determine the separate grades. All viewed in a conservative way. A possibility faced when grading a coin is the distinct difference in preservation and look of the obverse compared with the reverse. One grades higher than the other. A Barber half dollar can display these characteristics; the reverse rim for example, is fading into the lettering when the obverse rim is still bold and separated. 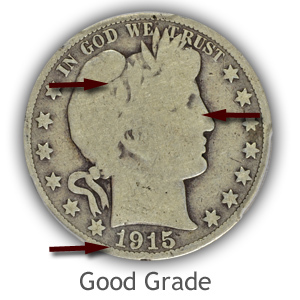 Grade differences; obverse to reverse, defaults to the lower condition side to determine the overall grade of the coin. Barber half dollars often display striking differences in boldness from obverse to reverse. The headband on the obverse is a high profile area and is subject to an incomplete strike. As a softly struck obverse coin wears, the lettering of Liberty fades sooner than a bolder struck coin. A softly struck reverse on the Barber half shows itself early as the coin wears in the right upper part of the horizontal lines of the shield. Often these lines fade quickly. As a Barber half wears to the point of the Good grade the rim begins to show its original striking weakness. A coin on one side can have a full bold rim fully separated from any design elements and the reverse rim is all but gone showing areas of merging with the design. A conservative grade takes into consideration both sides of the coin and finds an equal medium. Accurate grading results in accurate market value; a value both buyer and seller can agree. The image identifies the weakness of the rim on the reverse of this Good grade Barber half dollar. Judged as minor, the rim is faded but does not merge with the lettering. It demonstrates the coin was soft in strike in the area. The good news, there is no real impact on condition and value. 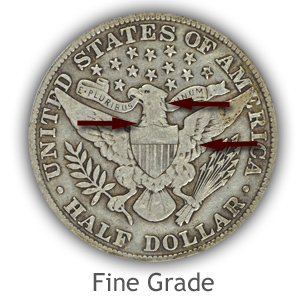 Visit the in-depth half dollar grading videos. 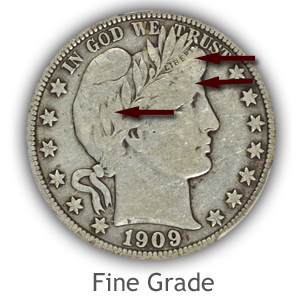 Detailed descriptions of the grading elements involved, combined with images highlighted with specific areas of the coin. Half dollars are valued according to series, date and mintmark with the additional importance of grade. 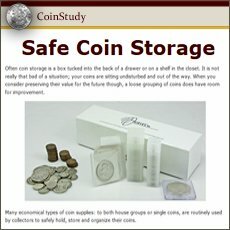 Video index of how to grade coins. Series of different denominations are judged with grading descriptions and images. Accurately determining the grade leads to accurate value. After the grading process assigns a grade, a value is determined. Barber half dollar value chart lists all dates and mints. All US coin values. Compare you coin to the image links leading to value charts. 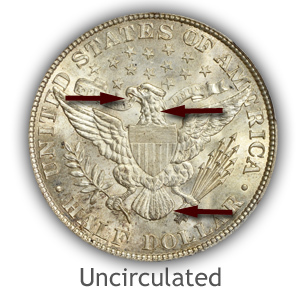 Important point to consider Date | Mintmark | Condition are described and imaged for each series. Surprising value is found in the smallest detail.